and not much is happening around here! Things are going on in my life- they just aren’t showing up here.Â I’ve been doing boring projects like cleaning and weeding, projects that I forgot to photograph before I sent them out- sleeves for some computers, and secret-for-now projects- gift type things. The garden is looking amazing. So many colors! The crocosmia are just starting. And in the back, my favorite combination. Blue lace-cap Hydrangea and anything. My desk is not completely bare of dolls. Now that I finished the *secret project* (I’ll tell later), I pulled out some partially finished dolls from before Brooklyn and I’m giving them faces, and hair. And life. Speaking of Brooklyn, I will be going to Renegade Chicago in September- hope to see you there! Okay, what else? I’ve been going through my scrap box, thinking quilt thoughts. We’ll see if anything materializes. Tomorrow I am driving up to Vermont for a few days. I am going to visit the Shelburne Museum. It looks like there is a lot of interesting goodies there- I’ll give the report when I get back. I think that’s it for now. Hope you had a great long week-end (in the US). The Boston fireworks were amazing! *note- today 6/16/09, I redid some of the details on this doll and changed the photos. This baby says flower fairy to me. 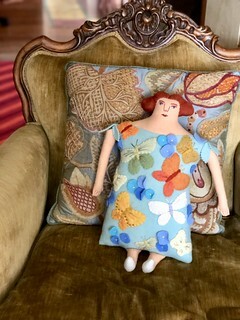 She is so soft- the green background is woven cashmere. The flowers in the crown are made of all soft knits- cashmere and angora blends. Here is the 4 babies together. 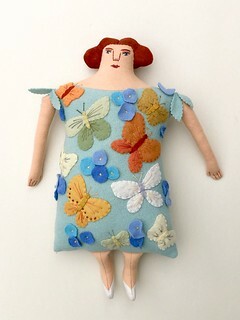 note- this is the old version of the baby- I changed the bottom flowers and added details into the blue butterfly. this baby is the antithesis of todays weather! So I got mentioned on Design Sponge last Friday- Thanks so much Camilla! Unfortunately I am working flat out for my show this weekend and won’t be putting any new work into my Etsy shop until next Monday. So- that is the word- shop update on Monday, December 15 starting at 12, eastern standard time. I have no idea what I will be posting because it will be what I have after the show. And one never knows about shows. this doll was very hard to photograph- so much dark. And I liked this top view and how she looked with her skirt all spread out. Her body is made out of a beautiful woven wool fabric from a thrifted mans’ shirt. And flowers and more flowers! Her dreadlocks are made by running ropes of wool roving through the washing machine. Yesterday was spent in the garden because frost was predicted for last night. I picked all the tomatoes- maybe some will ripen before they rot. I brought in all the flower pots and houseplants that had been out all summer. The porch is now a jungle! And I cut flowers. This is pretty much the only time of year when I bring flowers into the house. In general I like them better in the garden. But, for a while, I will enjoy my bounty. Aren’t those (slightly out of focus) dahlias amazing!